An article like Pete’s could be written about every large (and maybe small) city in the US at this point. (Editors take note.) If we characterize reggaeton’s story to date as one of translation, gestation, and commercialization, the next chapters would seem to be pointing toward localization, appropriation, and hybridization. (Pardon the Latinate litany, which not only is unwieldy but implies that all these processes are not always [already?] ongoing; better to “think them” as dynamically interacting rather than sequential.) Fueling as it is fueled by the youtubification of translocal cultural practice, reggaeton will not be running out of gasolina anytime soon. Writing for the Germaican reggae magazine Riddim, Christoph Twickel offers up the most comprehensive piece on Panamanian reggae I’ve seen to date. He covers a lot of ground: demographics on Panama (esp w/r/t Caribbean immigration); connections to roots reggae and Rastafari, bolero and calypso; an overview of early and important as well as contemporary performers, recordings, and venues; the place of New York in Panamanian reggae (and El General’s career specifically); class, race, and gender/machismo, etc. Not bad for a 2500 word piece. Only catch is, you gotta read German to understand it. Verstehen Sie mich? Er, apropos (passend?) — have you heard the triphoppy downtempo track I made by sampling all the phrases about not knowing German from a How to Speak German instructional cassette? (Most of us ethnomusicologists vergleichende Musikwissenschafters, you see, are glucky enough to have to learn German in grad school — it being one of the field’s foundational languages.) The simple (stupid?) joke of the track is that the speaker marshals an increasingly impressive storehouse of Deutsch phrases in order to express his utter ignorance of the language. I made it before visiting my friend Martin in Munich in late spring of ’01, which is why the guy asks, appropriately, “Wann kommen wir in Muenchen an? (When do we arrive in Munich? )” at the beginning (and end). It’s that time of the semester when things get extra crunchy, so I figure I better get this post up before it all becomes ancient history (even if it means I won’t be able to offer as texty a reflection as I’d like). Our panel was first thing Thursday morning (and I mean first thing: 7am! ), but despite the timing (and, no doubt, thanks to some jet-lagged mainlanders — not to mention supportive cohorts), it was relatively well-attended and pretty lively. I’d like to think the interest in our panel demonstrates that the constraints and chilling effects of copyright represent a growing concern for an increasing number of frustrated (media-engaged) scholars. Thursday afternoon’s Second Life session went pretty well too. And — funny thing — it was about as well attended, as shown in the pic above. Since I was a little preoccupied at the start of my own presentation — an overview of the “Big Gyptian” project — by the “fact” that Anthony’s avatar was seemingly stuck underwater, I’d have to say that Cliff’s presentation was the stronger and more succinct (a virtue in a virtual world). Discussing the “mothballing” of out-of-press New England country music, Cliff described the disturbing implications for scholars and practitioners alike: among other things, New England country musicians, despite a long and distinctive history of local expression, now tend to put on a Nashville drawl when they sing rather than, say, embrace the haunting yodel and French-Canadian/Maine accent of such predecessors as Betty Cody, who remains, despite some prominence in her day, a footnote in country music histories and whose music is resigned to pricey imports. Given such suggestive accompaniment and lucid exposition, we had a vibrant, if chaotic, conversation, generating a lot more questions and threads than could be pursued in our limited time (or in the limited medium of quickly scrolling text). I’m definitely interested in trying to figure out exactly how to structure such interactions for future events. Seems that threaded or “cascading” conversations might facilitate discussion, as would some sort of integration of voice (not to mention blocking out nearby, but unrelated, conversations). Anthony pointed out that it would be helpful, in certain cases, to recommend a set of preparatory readings in order to provide an inevitably diverse group of people with a common vocabulary or at least a shared understanding of the central concepts under consideration. Conversations about music and copyright can open into so many different realms, and they did, but there was something unsatisfying about being unable to respond to all the different ideas, or to move together in conversation. Hmmm. As for the papers presented at the conference, I’m happy to say that I enjoyed a great many, which is somewhat atypical. Indeed, I did a lot less of the ever-valuable (and fun) hanging-in-the-halls than usual. I would have liked to provide some annotations on all the talks that I attended and found stimulating, but I’m afraid I just don’t have the time. So allow me to leave you instead with this suggestive list of some highpoints (and invite further discussion in the comments, if there’s interest). SEM 2006 was a hoot overall. As the number of familiar faces increases, as I meet new grad students doing interesting things and asking sharp questions, and as I feel a bit more generational shift in the direction of my own passions and interests and orientations, the Society for Ethnomusicology feels more and more like an intellectual “home” to me. (Perhaps it helps that I finally finished my dissertation this year and thus can stand a bit taller.) One delightful — if bracing — thing I learned in Honolulu was that several dear colleagues actually read this here humble blog (despite — ahem — never commenting) and a few of my posts are being cited in papers here and there! Soon enough, we’ll have a critical mass of ethnomusibloggers out there, pushing the rich discourse of the musicnet into new places and perhaps pushing our lil discipline along as well. Onward and sideways, y’all. See ya next year. w/ resident DJs Zebo, Hess, and Chump — More of a head-noddin’ than a hip-shakin’ night, so I’ll be pursuing slow end of the low end theory. 10pm – 2am. No cover. Will offer some Hawaiian highlights before they get filed away like the dogeared program they’re scrawled on, but just so you don’t miss it, go out and git Heatwave‘s brand new (second hand) contribution to the Blogariddims series. If you’re still not signed up for Blogariddims, you’re sleepin. A solid series of mixes so far. And guess who’s slated to deliver the next one? 1) Although what Saunders was spinning could conceivably be described as a “narrow” slice of house, it’s remarkable how much stylistic range that can encompass. Alongside fellow Riddim Methodist, Larisa Mann (a/k/a, DJ Ripley), I’ll be “giving” a paper called “What Is Stolen? What Is Lost? Sharing Information in an Age of Litigation” at this year’s annual meeting of the Society for Ethnomusicology, which is happening in Honolulu from Nov 15-19. Yeah, it’s early, but if you happen to be in Hawaii, hope to see you there! With bells on, of course! Meet Hocus Opus, my Second Life avatar. It’s not that I don’t already have too much to do in my first/real life, but I confess that I’m rather excited about the possibilities for virtual, multimedia interactions — especially in the realm of ethno/music/ology — and SL seems to have the energy, resources, and critical mass to make such an experiment a “reality” (of sorts) at this point. I hope to persuade any willing early adopters out there to join me for some music-centered events in SL in the near future, including some exclusive — and hopefully fun and edifying — interactions and listening parties with some of my (and your) favorite DJs and producers. But I’ll be kicking things off this Thursday with a slightly more academic gathering. Coinciding with Becca’s class (which meets on Berkman Island on Thursday evenings) and with the annual meeting of the Society for Ethnomusicology (which happens to be in Honolulu this year), a couple of colleagues and I will be sharing some sounds and thoughts w/r/t music, copyright, and virtual worlds. Yesterday in CyberOne we had guests Mike Fricklas (General Counsel of Viacom) and Wayne Marshall (Ethnomusicologist and digital musician) in class to try to make empathic arguments to each other about the thorny issue of digital music production and consumption and copyright. They were wonderful. I recommend the video to you: http://cyber.law.harvard.edu/cyberone/wiki/Weeks_Pages/Week10#Lecture_Videos. As a follow-up event, we are holding a Music & Rights Forum at Berkman Island this Thursday evening at 9pm EST/6pm SLT. Music Professor Anthony McCann (University of Ulster), will lead a panel at which Wayne Marshall (University of Chicago) and Clifford Murphy (Brown University) will present some current research in ethnomusicology on the subject of music production/consumption and copyright. Wayne will be discussing the emergent genre of mashups — mashups usually combine the vocals from one song with the music from another — as a way of discussing current digital production methodology and its relationship to the law. Cliff will be discussing the “mothballing” of old and non-commercially viable music by companies that own the rights to that music. This event is an experiment in two ways. First, we are experimenting with the idea that presentations about music might be very effective in SL because the audience can both listen to the music and “listen” to the speaker at the same time. Second, we are experimenting with the idea that an academic panel discussion of the sort that usually happens at academic conferences could take place in SL. The purpose of the second goal is to consider whether we might lighten the carbon footprint caused by academic conferences by, at some point in the future, transitioning to holding some of them in a virtual world that would not require airplane travel. Please feel free to join us if you’re interested in checking it out. No doubt it will be a learning experience, but that’s the idea. ps — If you want to learn more about SL, I highly recommend Camille Dodero’s Phoenix piece, as well as New World Notes, which regularly covers and uncovers the wonders of this weird new world. pps — I recognize that SL is a far from perfect metaverse, but you gotta start somewhere. I’ll be presenting my recent findings alongside resident technicians DJ C and DJ Flack and their distinguished guest, DJ Rugged One. Earlier in the day, I’ll be talking about (digital) music and the internet to the CyberOne class. A follow-up to last year’s “Boston Mashacre,” the “Boston Smashacre” has been in the works for a while. It’s not just a sequel, though. It’s a different thing in kind. You can either stream the mix with the embedded player on the “Smaschare” page, download it as an mp3, or — and I strongly recommend this option — you can get it specially delivered to your cpu/pod/etc via the brand, spanking new w&w podcast, i.e., the “waxcast”: just copy the xml link below and paste it into whatever it is you use to subscribe to ‘casts (e.g., iTunes), and — Â¡Presto! — by the magic of xml, I’ll deliver semi-regular, relatively longform musically-expressed ideas about music directly to YOU, dear reader listener. Aright aready, go get smashed. *Of course, as it happens, I’m headed back this weekend and will be sharing some recent findings at Beat Research this Monday. 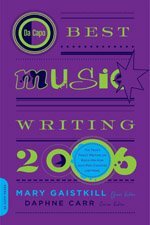 As noted elsewhere, this here humble blogger has been bestowed a spot in the 2006 edition of the illustrious Da Capo Best Music Writing series. What’s more, it’s one of my blog-posts — as opposed to a more traditionally “published” piece — which has earned itself the distinction. Of course, the post in question is the famous “we use so many snares” (aug ’05), an exploratory exposition on reggaeton which resonated, almost immediately, with music bloggerati and aspiring reggaeton producers alike. Indeed, the same post (and its critical reception) is more-or-less what landed me an invitation to write for the Boston Pheonix, which in turn (and in conjunction) landed me an invitation to co-edit a forthcoming anthology on reggaeton. So the rewards for deciding one random night to put my thoughts together and put ’em “out there” have been abundant. (Take note, aspiring “music writers.”) And I have to admit that I’m pretty psyched, being an aspiring bookwriter and all, that something I just threw off late one night turns out to be my first inclusion in an actual book on actual shelves in actual stores. Of course, the implication that blog discourse is now eligible to be considered alongside, say, pieces in the The New Yorker, is a pleasant bit of levelling more broadly (which also makes me happy). And it delights me as well that my embrace of the multimedia potential of the webbyweb — integrating screen shots, hyperlinked “footnotes,” and audio samples — seemed to be what made the post so (literally) resonant. I’ve got to thank editors Daphne Carr and Mary Gaitskill for selecting my post for inclusion, of course, but I’ve also got to thank /Jace, Simon, Catchdeezy, and all the folks who somehow decided — prolly via one of those three — that the post was the reggaeton post and should be shared on message boards of all sorts. As one can see, all that activity sent the ol’ sitemeter into a late-summer convulsion of sorts and brought my “music writing” to lots of people’s attention. F’real though, I’d like to take this golden opportunity to encourage any and all readers out there to leave comments if ever so inspired (and you need not be soooo inspired) — not because there’s a possibility it’ll get published and you’ll get (modestly) paid, but because I deeply appreciate people sharing their perspectives with me, telling me what they think I’ve gotten wrong and gotten right, pointing me to new things, and challenging me to beat-making contests. As the story of the post with so-many-lives attests, this blogging thing really does feed back into my work. For me, the blog is an experiment in voice, a method of research and publication, a writing discipline, a journal, a wiki, and an art project rolled into one. It’s not that I’m hoping you’ll all become my research assistants (though collaborators are welcome), but rather that you’ll engage in conversation with me, helping me to hear as we listen for the snares to shift yet again. Which is to say, lend me your ears and I’ll lend you mine. Charlie Nesson has been on a YouTube tear of late. And though, given that his clips often lack a certain coherence, I look fwd to the day that my dear dad-in-law (“in law” indeed) becomes a video wiz, I love that he’s been embracing the tech (as always) and launching headlong into exploring and sharing the possibilities. This is it, just as i received it from Rich Kilberg, who now runs Fred Friendly Seminars, my most fondly remembered seminar, the first we did televised for national tv. Fun to see how young we were in 1982. iâ€™m posting just the first fifteen minutes. Beware the first thirty seconds of blackness. i didnâ€™t want to cut even that. After this i was offered a Sunday morning affairs program by CBS and turned it down, not wanting to go commercial. Hail to Fred Friendly. He could put a table together. As an example of how the work of Clifford Geertz might continue to inform our understanding of (the significance of) culture, consider the following passage from William Sewell’s Logics of History (Chicago 2005), itself a compelling interpretation of a series of texts. 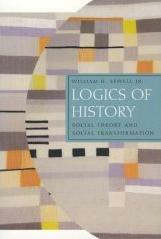 Bringing the methods and insights of the social sciences and the ‘histories’ to bear on each other, Sewell’s book is a persuasive exercise in reconfiguring social theory. The only way for humans to produce specific behavior appropriate to the challenges thrown up by their environment is to use the manifold cultural codes that their peculiar neural structure has made possible. Because humans’ genetically programmed responses are so generalized, they need the extrinsic information supplied by culture in order to accomplish the diverse tasks of life — whether those be responding to threats, constructing shelter, reproducing the species, seeking companionship, killing other species for food, or constructing political regulations. Humans proceed, and can only proceed, by gathering and manipulating information (including information about how to gather information) which is stored not in the physiological structure of the body but in the intersubjective space of human signifying practice and in the objects — books, map, clothing, tools, sacred goods, illustrations, the built environment — that give it material form. Intellectually unviable without culture, humans would be emotionally unviable as well. Geertz remarks that “man is the most emotional, as well as the most rational animal” (80). He might have added the most emotional because the most rational. The emotional diffuseness or uncertainty of the human neural response to stimuli is the flip side of the existence of the complex neural apparatus that makes us capable of reasoning. The response to stimuli can be diffuse because our reasoning brain makes possible tremendous and adaptively useful flexibility in how we deal with a problem; it must be diffuse if we are to deal with a problem flexibly rather than in a stereotyped fashion. But this makes the human “a peculiarly high-strung animal,” subject to all sorts of emotional excitement but without in-built patterns to guide responses to the excitement (80). It is cultural patterns that provide the necessary control of emotionally upsetting stimuli. They give “specific, explicit, determinate form to the general, diffuse, ongoing flow of bodily sensation,” thereby “imposing upon the continual shifts in sentience to which we are inherently subject a recognizable, meaningful order, so that we may not only feel but know what we feel and act accordingly” (80). This provision of specific form for diffuse and unsettling human emotion is, according to Geertz, precisely what religions are about. They provide us with conceptions and practices that enable us to live with the ever-present threat of chaos. In “Religion as a Cultural System,” Geertz specifies three sources of such threat: events or problems that seem beyond our powers of explanation, suffering that seems impossible to endure, and ethical paradoxes that seem impossible to resolve. What religious symbolism does is not to deny the existence of the uncanny, of suffering, or of evil, but to provide concepts that make them thinkable (such as divine mystery, imitation of Christ, or original sin) and ritual practices that give them an experiential reality (such as Eucharist, extreme unction, or penance). Religious doctrine, mirrored and experienced in ritual acts, does not, for example, spare us from suffering: it teaches us “how to suffer, how to make of physical pain, personal loss, worldly defeat, or the helpless contemplation of others’ agony something bearable, supportable — something, as we say, sufferable” (104). In short, our neural organization necessitates as well as makes possible the shaping of both our cognitive and emotional lives by systems of symbols.